There’s no doubt that our sedentary lifestyles are driving factors of the current obesity “epidemic”. We spend 8 hours a day sitting at a desk, then get home and binge the latest Netflix originals. It’s tough to maintain a healthy balance, especially if you live in the city and just can’t find the time or confidence to go to a gym. It’s usually around this time that we think this year will finally be the year that we start doing something about it. We might even convince ourselves to buy a fitness watch Xiaomi Amazfit Pace Review: Solid Smartwatch at a Budget Price Xiaomi Amazfit Pace Review: Solid Smartwatch at a Budget Price For the price, we can wholeheartedly recommend the Amazfit. It's certainly not without flaws, but it delivers on most of its features while looking great. Read More , because literally the only reason we’ve never been running before was the lack of GPS coordinates and email notifications on our wrist. But for me at least, the truth is that the thought of spending an hour or so just exercising seems like an incredible waste of time. I have emails to respond to! This year, Flexispot might have the answer, in the form of the Deskcise Pro – an all-in-one desk and exercise bike, available on Amazon for under $500. Read on to find out what we thought of this whole desk bike thing, and how to win one for yourself. The Flexispot Deskcise Pro is compact and easy to push around, though it’s incredibly heavy. It doesn’t fold up, but with an overall footprint of 32″ x 23″, it’s small enough to be tucked under the cupboards when not in use, and otherwise unobtrusive in a normal sized room. From a design perspective, there’s only so many ways you can mount a desk on to an exercise bike. Flexispot have opted for a long metal leg in the centre of the desk. A basic cycling computer keeps track of the usual speed, distance, RPM, calories, and time. A long press on the single button resets the stats. There’s nothing fancy here: it doesn’t connect to an app on your phone to record workouts. In terms of noise, it’s nearly silent aside from a loud beep as the cycling computer wakes up. 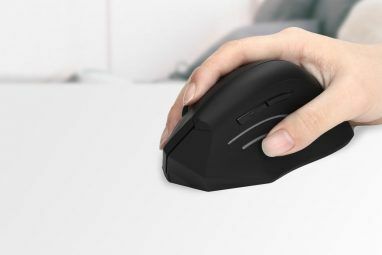 There should be no issue with using this in a normal working environment – your typing will be louder. Pedalling is smooth, and Flexispot have included some rubber covers to make it comfortable even in socks or bare feet. Stability: Would I Click on The Wrong Things? Since this is an entirely new product category for me, I had two overriding concerns coming into this review. First was about stability. 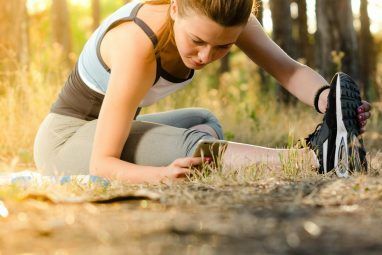 There’s generally a good reason we don’t try to multitask while exercising, and that’s because the equipment (and our body) tends to move around a lot. How stable would the Deskcise Pro be with a small desk and laptop mounted on the end of a single metal leg? Surely it would shuffle around and make using a trackpad impossible? Would I be clicking on all the wrong tabs and inserting random letters in places they shouldn’t be? Feasibility: Can I Really Work on This? Secondly – and more broadly speaking – how feasible is it to even cycle and work at the same time? Would I be as productive as normal? It’s not easy being the MakeUseOf lead developer, reviews editor, and YouTube manager, you know. It means the time I spend at work needs to be productive in every way. I’m pleased to report a positive experience in all aspects. Like most exercise bikes, the Flexispot desk bike is ludicrously heavy thanks to a flywheel that provides adjustable degrees of magnetic pedal resistance. Not only is it stable enough to type, click, scroll and generally do all the things I normally do, just as fast – but it’s also easy to forget I’m even cycling at the same time. That means I’m inclined to exercise more. My wife doesn’t type much, but she was quite happy to sit there and cycle while she scrolled through Facebook (it’s a terrible habit Facebook Makes You Sad, and "It Won't Happen to Me" is a Lie Facebook Makes You Sad, and "It Won't Happen to Me" is a Lie Facebook's potential as a trigger for depressive symptoms has been talked about in the past too, but this year has seen more of such studies than before. Here's what they say. Read More , but if she’s going to do it, then at least she can keep active at the same time). At higher workout intensities (and the highest desk setting), it wobbles quite a bit, as you’d expect. For that reason I wouldn’t suggest putting a cup of coffee on there. However, for typing and trackpad use, I found my body would mimic the same motions, so the net effect was that I could carry on as easily as before. If I had simply put an exercise bike under a fixed standing desk, this would likely not have worked. There’s four points of adjustment on the Flexispot desk bike that ensures you can find an appropriate setting for you. The first is pedal resistance, standard on most exercise bikes. It ranges from -1 (off), to 8. 7 seemed like the ideal resistance for a little burn without compromising my ability to think straight. Anything less than 6 didn’t put up much of a fight, though of course anything would be better than being completely sedentary. Next, there’s the seat height. I’m 185cm / 6’1″, and the highest setting seemed just about right. Flexispot says it should handle anyone from 5’1 to 6’2″, which seems accurate. The desk height can be adjusted separate to the seat height, and should suit all preferences. Lastly, the desk can be adjusted back and forth, pulling it closer or pushing it further away from you. I wasn’t expecting to have this feature, but given the built in rubber wrist rest, it’s a great addition. The seat and desk height are quite tricky to lower, requiring a good bit of force to push down. They’re pneumatic though, so they were easy to pop back up again. If I had one complaint to make of the desk, it’s that the laminate surface is too slippery. A non-slip coating would have been much appreciated. The plastic case I’ve been using on my MacBook Air was just unusable on the desk, and I nearly dropped it 4 foot while testing the back and forth adjustment. Even without the case, the MacBook has slippery plastic nubs instead of non-stick rubber pads underneath. Other laptops I tried didn’t have this issue at all. Obviously, my beef is with more with Apple here than Flexispot, but my point is: you may need to buy some kind of rubber mat to prevent slippage. Bored of Cycling? Stand Instead! Here’s where the Flexispot Deskcise really excels: the height of the desk is such that it can also work as a regular standing desk. The health virtues of a standing desk aren’t entirely clear (or maybe I’m just doing it wrong 5 Things You're Doing Wrong At Your Standing Desk 5 Things You're Doing Wrong At Your Standing Desk Many people, especially those who work from home, are looking to standing desks as the solution for prevention of several serious health issues caused by sitting all day, but not everyone uses it correctly. Read More ), but having the option is great, and a welcome break from the cycling if you get tired. By alternating between the two, you could spend your whole work day on this. However, you may need to sacrifice the rubber wrist pad and stand around the other side of the desk, as the bike seat can get in the way. Should You Buy the Flexispot Desk Bike? I’m a middle-aged bald white guy, and fat. It’s that last one that bugs me. I can’t promise the desk bike is going to change that, but presumably going from almost zero exercise a day to an hour or more can only have a positive effect, so I’ll report back in a few months if I’ve actually lost weight. I’m not sure why the concept of a desk bike hasn’t received more attention until now. I love multitasking, so idea of going to a gym specifically for the purpose of doing exercising just seems like such a waste of time. I could be writing, dealing with the deluge of emails that’s acquired in my inbox since an hour ago, or even just watching the latest season of whatever I’m suffering FOMO of. If the only thing you need to work is a laptop, this is the solution you’ve been looking for. 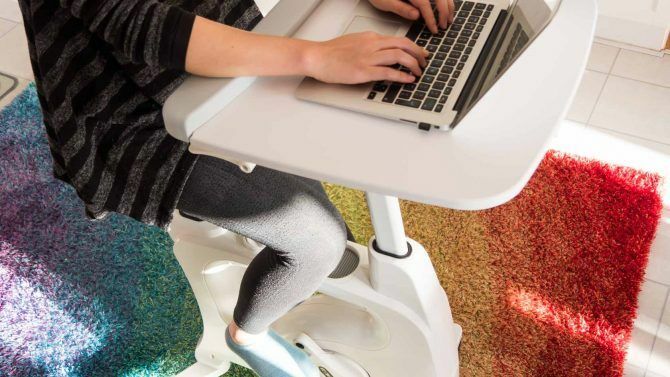 Whether seated, standing, or cycling – the Flexispot Deskcise Pro does it all. Explore more about: Exercise, Health, Standing Desk. I have never seen nor heard of one of these! 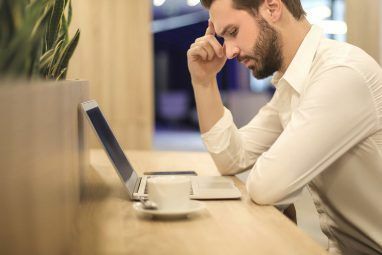 But it looks pretty fun and a good way to keep moving, while doing things like working on the laptop or even writing, some people, like myself get really fidgety when sitting too long, it's good to be able to move about while still being able to get work done. This is a complete waste of money. If the goal is to lose weight but still be a desk jockey, then just simply reduce how much food you intake. Why do you need a gizmo like this? Okay, so if you've decided to do this, instead of reducing calorie intake, then to get any kind of significant weight loss through desk-cycling means you'll have to do it all day long, which means you'll likely get injured, probably your lower back, and your knees too. Not only is doing 1000's of reps a factor, but the fact that it's a very isolated movement that doesn't engage your entire body is a very silly state of being, exercise or not. This man will still be overweight next year and the year after with the mindset he has. Why don't you just go for a walk every few hours, do 5 mins of squats, pushups and situps? You already have a floor to do that, which costs nothing, and your impact on healthy will be 3x better than with this dumb gimmick. Keep the good articles comming!